This 150 calorie salad is not only healthy, but also very low in fat. 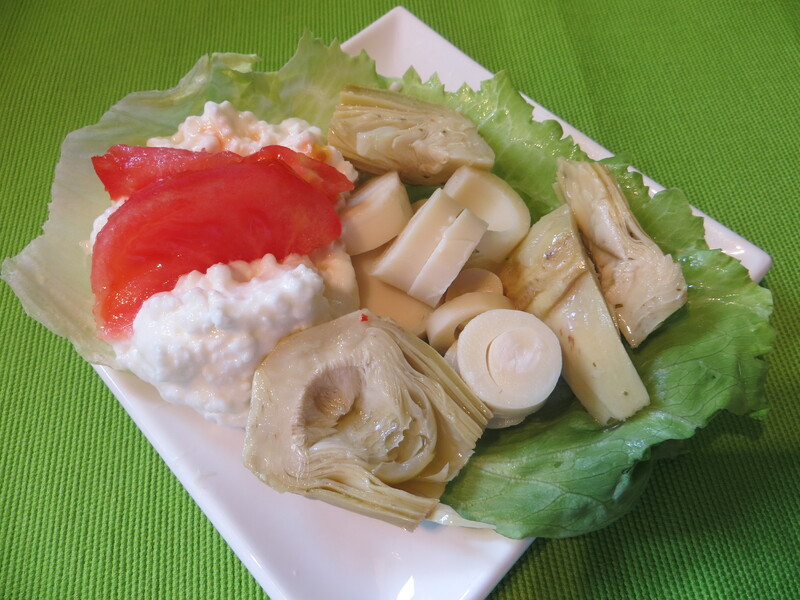 It contains artichoke hearts marinated in oil, sliced hearts of palm (in water), low fat cottage cheese on a bed of lettuce and one halved tomato slice. Add freshly ground pepper to taste. Costco has an incredible selection of hearts of palm and artichoke hearts that are ready to serve right out of the jar. This tasty salad contains a good portion of vitamin C, zero cholesterol and can be served in a matter of minutes. Consider adding chopped white or green asparagus tips for additional color. These too are available at Costco in ready-to-serve jars. This salad is a perfect addition to a main course of spaghetti or lasagna. Red leaf lettuce can also be substituted for the bib lettuce.